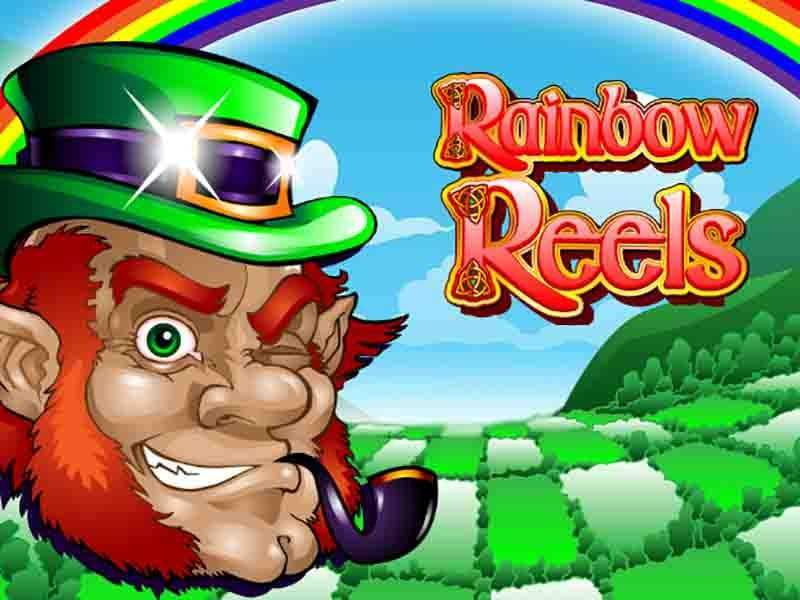 The Rainbow Reels is a game developed by the famous Novomatic gaming house. This is an Irish based pokie with all the characteristic related to luck (pots, rainbow, gold, Leprechaun, etc.). It possesses 5 reels and 20 adjustable pay lines. This is a real casino game of fortune with lots of free spins and bonus levels. To activate the wheel of luck, a player needs to click on the “Spin” button. This can be done by selecting the auto roll option for easier spinning. In the main menu, a gambler can set the “Bet/Line” parameter. By doing this, he/she can increase or decrease the stake value. All wins in the Rainbow Reels online will be paid from left to the right side of a game screen. If a gamer wants to check out all of the information about the icons, extra cards or settings he/she can see the “Paytable” window. Over the Rainbow – this feature can be triggered when a player collects 3 or more scatter signs that can only appear on reels 3, 4 and 5. For doing it, he/she will be rewarded with a bonus level. A gambler needs to pick 4 leafs to reveal prizes. Pot of Wealth – to trigger this extra game a gambler must gather 3 or more pot scatter icons. They can be found on reels 2, 3 and 4. In this bonus, a bettor needs to select a pot to get a reward. Wishing Well – this feature can be activated only if a player gets 3 or more wishing scatter symbols that appear on reels 3, 4 and 5. The goal is to pick a wishing well to reveal a prize. These extra games can be won at any moment. The outcome is totally random. Besides these special cards, a gambler can find a wild symbol that can replace any icon except for the extra sign. The Novomatic vendor offers a gambling option for all bettors who want a second chance to increase their cash even more. This feature can be activated after every winning line. The goal is to pick the next coming card color (black or red). For making a right guess, a gambler will double the money. Gambling process can be repeated again. This means that bettors can double their prizes multiple times while they play free Rainbow Reels casino slot machine. To increase scoring possibilities, bettors need to set the wager to the maximum for the biggest payouts. Collect scatter icons to gain extra real money rewards. The best way to win is to play more rounds to additionally enhance the winning odds. Be sure to adjust the number of lines to the maximum. By doing this, a gambler will increase the number of possible win outcomes and combos. The biggest payout can be obtained for collecting 5 wild symbols. This online game can be played by any gamer above 18+ for real cash with no download required from the UK or any other country where gambling is legal. The theoretical return to a player for this slot is 96%. Adjust you gaming parameters in the main menu and spin the wheel for real money prizes. 0 responses to "Rainbow Reels Slot"